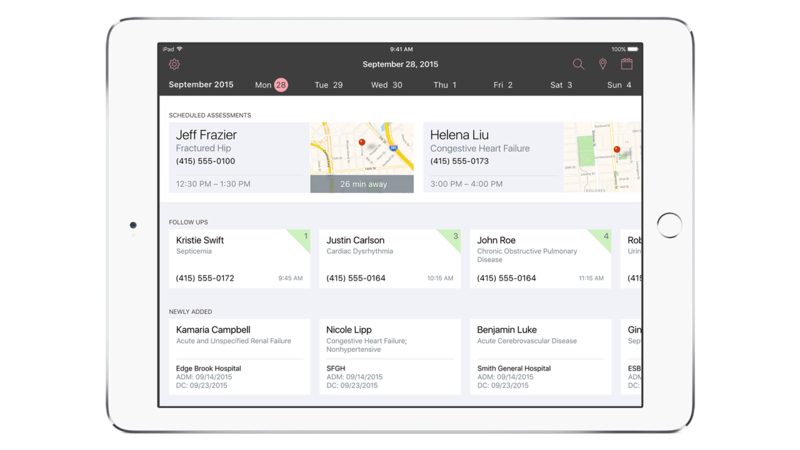 IBM MobileFirst for iOS Case Manager offers task and information management for caseworkers that contains every tool needed for remote patient visits. Your Home screen shows scheduled visits grouped by case type – follow ups, assessments and new cases. New assessments display a map to open GPS. Tap a visit Card to see each name, diagnosis, address, visit time, and phone number. Follow-ups include preferred call time. See new members due to complete enrollment at the bottom of the screen. The Today’s View icon displays your agenda in a sidebar, and all cards are color-coded to distinguish types for one another. Today’s total time displays on the Home screen. Travel time is added to each visit so that you can’t be overbooked when you need to be on the road to your next case. Pull up your next visit card to view Member details. Cards include case IDs, diagnoses, hospital stay data, primary care physicians and notes – including full case histories if available. You can also see a Member’s insurance, HIPAA designee and any other information necessary to complete your assessment. Start assessments from links in each visit card. Simply tap to enter your patient’s answers. The Initial Assessment starts with general questions on to medications, durable medical equipment, goals for better health and more. Add notes and include a photo or voice memo using built-in iPad functionality. Common responses such as medication doses and standard medical apparatus are provided. Add custom information when necessary, and send reports fast.